On arrival you will be warmly welcomed by your instructor and then have a full briefing before heading out to the aircraft with your instructor for the pre-flight inspection. 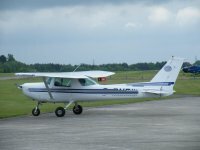 We operate modern, well equipped Cessna 152, Robin HR200, and Alpha120T aeroplanes; these aircraft are probably the most popular training aircraft in the country. They are easy to learn in and fun to fly. Built and maintained to a very high standard, they have an excellent safety record. All are equipped with various navigation aids together with transponders, which in effect means you will show up on an air traffic controller's radar screen. Trial flights include temporary day membership of the flying club at Earls Colne, a chance to take the controls of a light aircraft and experience fantastic views of the local area. Our aim is that you have an unforgettable experience. Warm and waterproof clothes are a must, airfields are by their nature exposed to the elements, as you will discover when doing your pre-flight inspection of the aircraft! Event takes place at Earls Colne in Essex .